Summary: Eating more than 10 grams of nuts a day has been linked to improved cognitive function, by up to 60%, in older adults. Long-term, high nut consumption could be the key to better cognitive health in older people according to new research from the University of South Australia. In a study of 4822 Chinese adults aged 55+ years, researchers found that eating more than 10 grams of nuts a day was positively associated with better mental functioning, including improved thinking, reasoning, and memory. Lead researcher, UniSA’s Dr. Ming Li, says the study is the first to report an association between cognition and nut intake in older Chinese adults, providing important insights into increasing mental health issues (including dementia) faced by an aging population. “Population aging is one of the most substantial challenges of the twenty-first century. Not only are people living longer, but as they age, they require additional health support which is placing unprecedented pressure on aged-care and health services,” Dr. Li says. “In China, this is a massive issue, as the population is aging far more rapidly than almost any other country in the world. China has one of the fastest growing aging populations. In 2029, China’s population is projected to peak at 1.44 billion, with the ratio of young to old dramatically imbalanced by the rising ranks of the elderly. By 2050, 330 million Chinese will be over age 65, and 90.4 million will be over age 80, representing the world’s largest population of this most elderly age group. In a study of 4822 Chinese adults aged 55+ years, researchers found that eating more than 10 grams of nuts a day was positively associated with better mental functioning, including improved thinking, reasoning and memory. The image is in the public domain. The UniSA study analyzed nine waves of China Health Nutrition Survey data collected over 22 years, finding that 17 percent of participants were regular consumers of nuts (mostly peanuts). Dr Li says peanuts have specific anti-inflammatory and antioxidant effects which can alleviate and reduce cognitive decline. “Nuts are known to be high in healthy fats, protein, and fiber with nutritional properties that can lower cholesterol and improve cognitive health,” Dr Li says. The image is adapted from the University of South Australia news release. We aimed to investigate the association of nut intake with cognitive function in Chinese adults aged 55 and over. This was a prospective open cohort study with repeated measurements of diet and cognition scores. 4822 adults aged 55 and over participating in the China Health Nutrition Survey during 1991–2006. Global cognitive function measured repeatedly in 1997, 2001, 2004, and 2006 using a subset of modified Telephone Interview for Cognitive Status; poor cognitive function was defined as cognition score<7. Nut consumption was collected using 3-day 24 recall method in 1991, 1993, and at surveys of cognition assessment. Multilevel mixed effect linear regression and logistic regression analysis were conducted to assess the association with cognitive function. The unadjusted cognitive score decreased by 0.29 (95% CI 0.22–0.28) with one-year aging during 1997–2006. 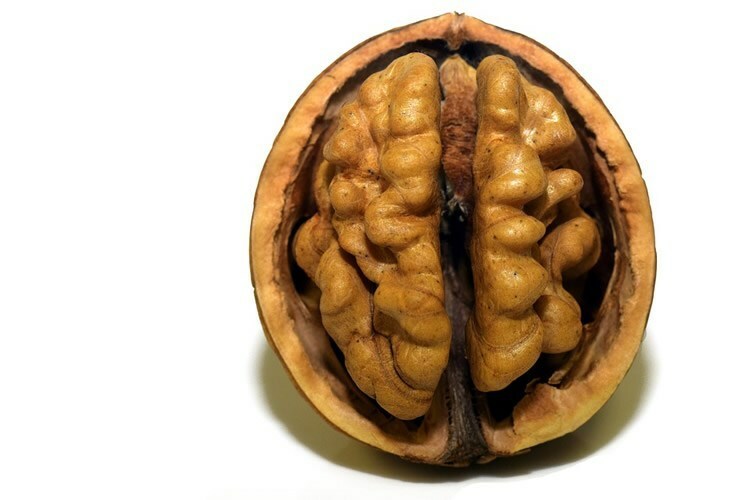 Nut intake of more than 10g/d was associated with higher cognition score by 0.63 points (95% CI 0.15–1.12) or 40% less likely to have poor cognitive function (OR 0.60, 95% CI 0.43–0.84) after adjusted for demographic, lifestyle behavioural, BMI, and energy intake. Nut consumption was inversely associated with cognition decline.